For the past few days I have been pouring slip. Slip casting, if you are not familiar (simplified) involves a thinned clay body worked into moulds in order to create hollow forms. These forms are later fired in a kiln (wood fired, electric fired or gas fired). The pieces I am working on will be electric kiln fired to Bisque. I am creating rough parts of Myself. The concept is to place myself within my work on a figurative level. Perhaps even bring these ‘selves‘ (or incarnations of self (there is an elf in self)) with me to various locations that hold profound meaning and quite literally leave a part or a piece of myself there. These clay forms are mixed with glass and cast within as well as act as a mould to hold the glass. Building small ‘smoke ovens’ (or pit oven) in my backyard- the bisque work will be oxidized and patinated. I have no idea if these smoke firings will effect the glass but, am excited to find out! I am seriously hoping to build a small smoke/pit oven in Iceland and work with dried kelp, lichen and moss (found on the beaches), even sheep or Iceland horse patties – to see how these influence the clay! OMGods! Just writing that made me think about Mývatn and the mud there.. full of sulphur. Maybe I can use some of this volcanic blue mud, and red earth as a paintable slip?! So, of course that’s not all! 🙂 The body of work, The Air WE breathe involves sound sculptures/field recordings. Andrei and I have been building up our sound library. While Andrei primarily works on the synthesized portion I am collecting Field Recordings. I am travelling back to Iceland in 2015 with my audio recording device, wind socks, monitors and hydrophone! 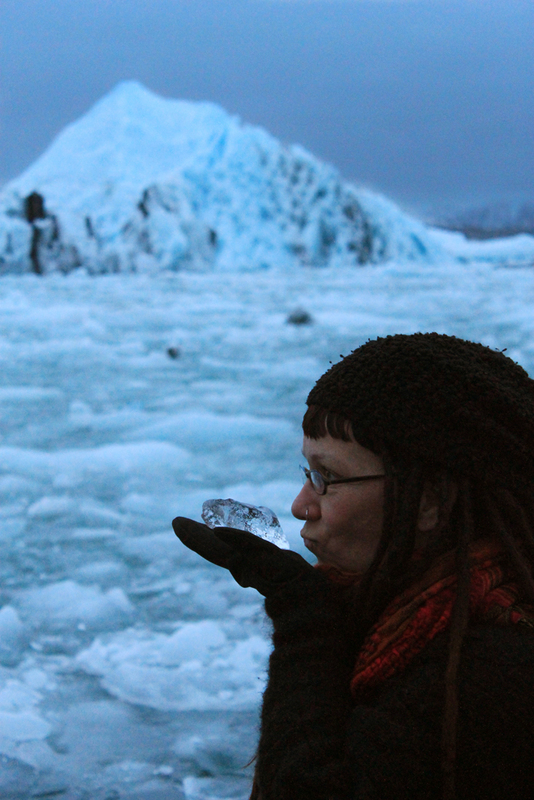 When I visited Jökulsárlón with Laura we felt the the lagoon. There was definitely something other than ice in that water… Prometheus aside 😉 it was like an eighth sense.. primordial. Visceral. Slightly eery. Later, on the other side of the lagoon I heard a strange, sad melancholic (seal?) calling out over the lagoon. Naturally my phone didn’t work fast enough and I missed recording it. I have incredibly high hopes to locate that sound (that spirit?) again, upon my return.